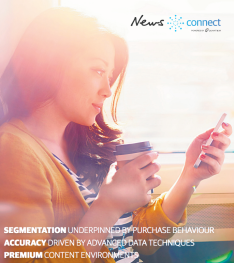 News Corp has taken the plunge and launched a new data advertising solution called News Connect. Miranda Ward spoke to News’ head of digital sales strategy Cameron King about the new offering. News Corp made a lot of announcements at its upfront style ‘Come Together’ event earlier this year. The most game changing of them was its partnership with Quantium to marry up its vast trove of online data with offline data called News Connect. The partnership with Quantium will see its bank of data on the offline shopping, travel and purchasing habits of eight million Australians made available to advertisers along with News Corp’s data, which the company says covers seven million readers. Cameron King, News Corp head of digital sales strategy, said News Connect is essentially an advertising product that “combines what people watch and read with what they purchase”. “There’s two underlying data assets. We have a range of segments which are powered by Quantium data through the partnership we have with them. By and large there is a range of existing, off the shelf segments advertisers can buy based on that data,” King explained. The “off-the-shelf solution” means advertisers are able to buy a range of segments immediately. “Those segments are grouped into a variety of product groups that look at people’s intent to buy or frequency of purchase around everything from health food to premium products in the supermarket right to if they are currently an insurance customers,” said King. Essentially it means advertisers wanting to target audiences, for example, looking to buy a car can do so by purchasing a solution with News Corp via its News Connect product. “What we’re offering is media on our network that is targeted to people who we’ve identified as being in the market for a car,” explained King. “Being in the market for a car is heavy qualified in the data modelling capability we’ve built out. We know these people belong to these particular segments with up to 95 per cent accuracy. The predictive quality of Connect is incredibly powerful. “It uses the same underlying statistical techniques to approve credit card applications,” he added. King said the opportunity is to reach “highly qualified and highly accurate” audience segments with advertising campaigns that are being planned immediately as opposed to waiting or “using data where the source of the information is a little speculative”. News Corp are targeting a “broad spectrum” of advertisers with the product. “The availability of retail transaction and supermarket data obviously has particular appeal to packaged goods categories,” said King. Advertisers using the News Connect product can purchase media across News Corp’s media network, however does not currently extend to any advertising around external distribution points such as Facebook’s Instant Articles or Apple News. “As we evaluate those sorts of content platforms we’ll certainly look at how we can improve the advertising experience there through targeting,” said King. News Corp has been trialling its News Connect reader surveys since December last year offering readers free access to its online website in exchange for personal data. On what News Corp has learnt through the trial process, as well as trialling the Quantium aspect since the Come Together event at the end of July, King said the product has been refined “in terms of the predictive quality of the segments”. “We do a match with our known audience based on the data we get by virtue of either Quantium or the micro-surveys we do and we use that to build a predictive model that identifies the likely behaviour for our anonymous audience so we can overarch that across the 10m people we reach each month,” said King. “It’s not a one-to-one match for the segments, it’s a model segment. What we’ve really been doing is refining the accuracy of those models so we have statistical certainty that if we say someone is in the market for cat food then someone is in the market for cat food.